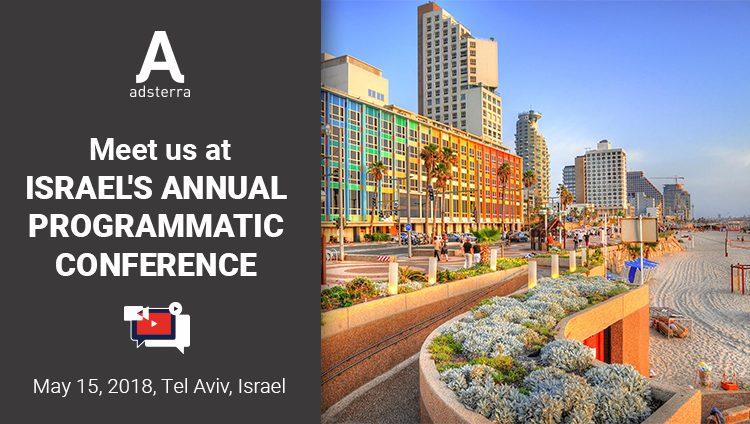 Adsterra representatives are coming back to Tel Aviv, Israel to attend Israel’s annual programmatic conference, held on May, 15. After the success of Video Trends for 2018 conference, the discussion is moving further. This time Israel’s annual programmatic conference would gather over 350 best Video Tech companies and around 1000 attendees. Over 30 speakers will cover the most important trends and issues among which are blockchain, programmatic video, women leadership and more. No doubt that’s a great chance for networking and sharing experience. Seize an opportunity to meet Adsterra team in person to talk business. Schedule your meeting today and meet us at Israel’s annual programmatic conference 2018!